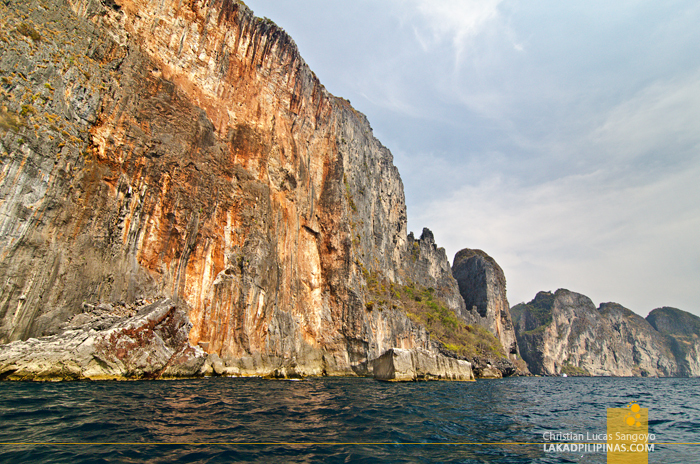 I refused to believe that there’s a gap on the limestone karsts surrounding The Beach. But believe, I must, even if the secret cove where DiCaprio and a bunch of other transcendental backpackers swam, fished, fought sharks and played their beach games was totally closed off. 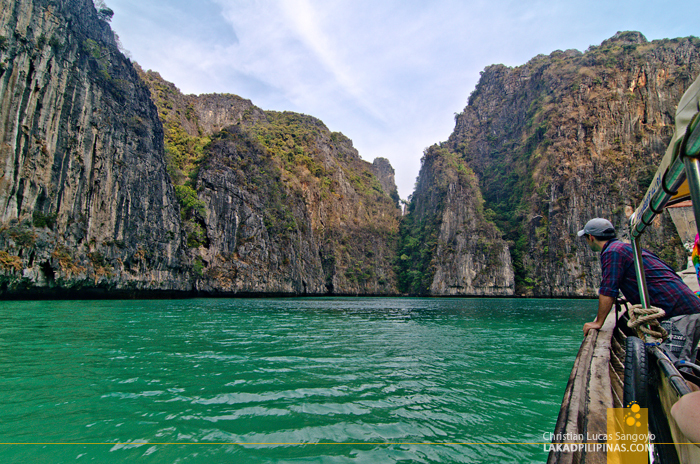 Well, that’s where we came in to dock at Maya Bay, the very place where Alex Garland’s novel was turned into a cult backpacker’s film. And it was not as it was. 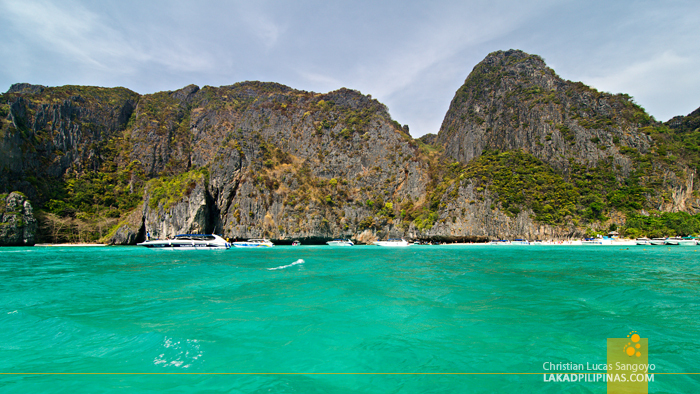 It was on our third day in Koh Phi Phi Don when we finally decided to book a tour to see the famous Maya Bay. We initially thought of getting a sunrise tour, to arrive before the hordes of tourists get to The Beach, but it was just way out of our budget. 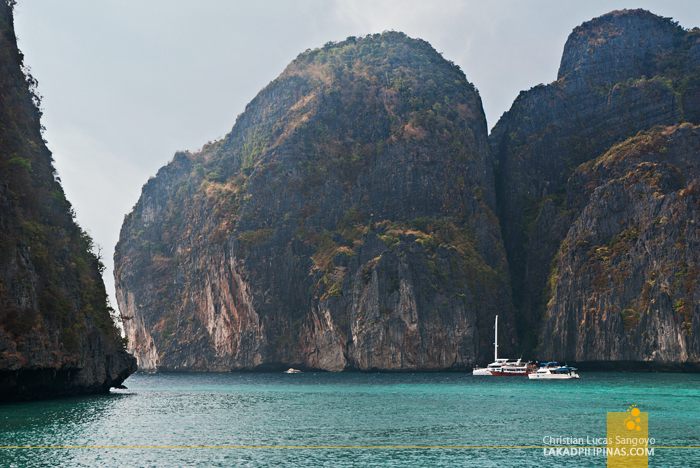 We checked with the tour operators on the island and found the cheapest deal at a stall near the Loh Dalum Bay area. 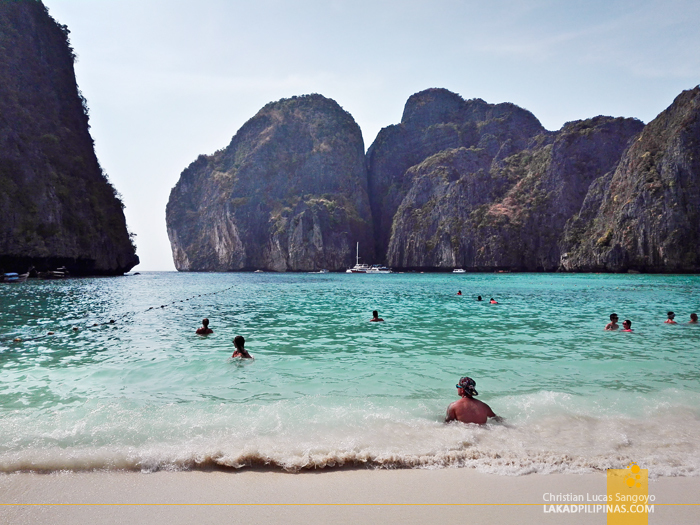 For THB300.00 (plus an additional THB200.00 for the Maya Bay entrance fee) we were gonna do a half-day boat tour around Koh Phi Phi Leh, which includes a visit to the Monkey Beach, Loh Samah Bay, Phileh Bay, Viking Cave and, of course, Maya Bay. It includes food, which wasn’t really anything to rave for, life jackets for those who aren’t adept in swimming and snorkeling gear. It was still somewhat expensive, but we went ahead and booked it. 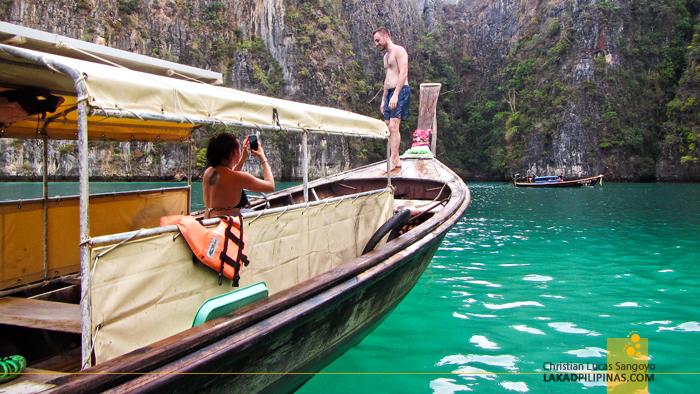 Our half-day sunset boat tour started at midday. 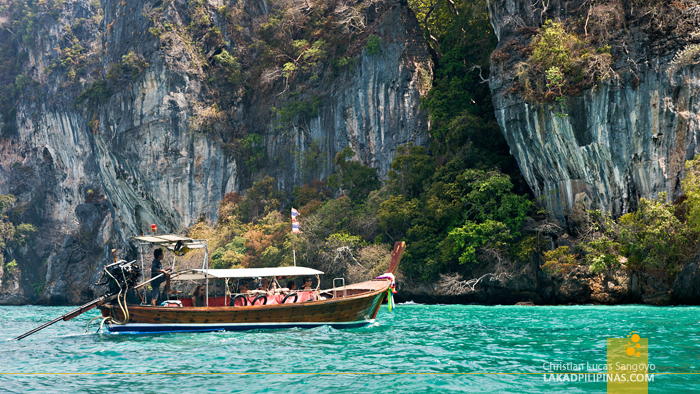 And amidst clear blue sky and aquamarine waters, we boarded a traditional Thai long-tail boat with a group of Europeans and roared off to the Andaman Sea. The first stop of the tour was at Monkey Beach. 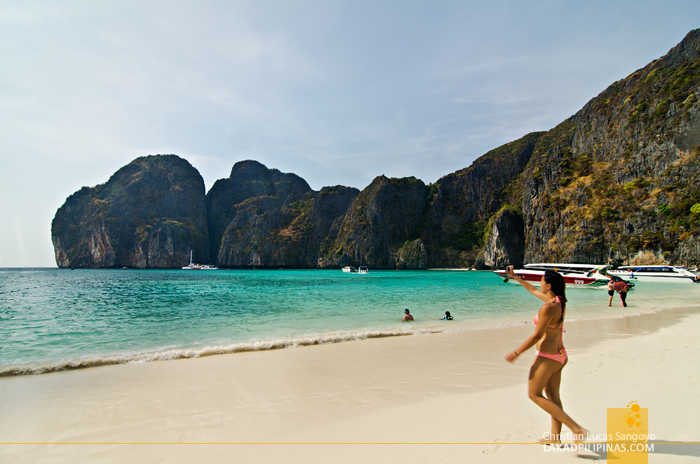 While this beach is still part of Koh Phi Phi Don Island where tourists in Koh Phi Phi stay, it is totally inaccessible by land. The cove is quite small and bordered by towering limestone cliffs, the incoming tide almost wiping out what little shore it has. 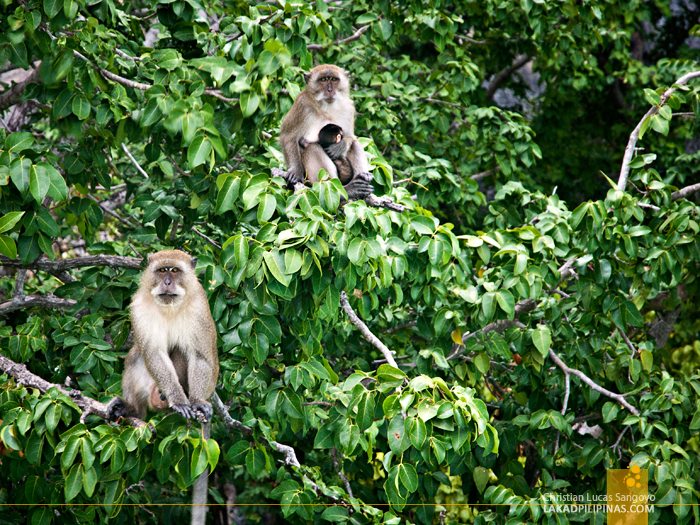 As we docked, a long-tailed macaque monkey quickly swam towards our boat, his furry brethrens, looking on from the branches of the trees along the beach. Another more feisty one, quickly jumped on the prow of our boat—probably looking for us to feed him. Indeed, this place isn’t called Monkey Island for nothing. We departed after only a few minutes. 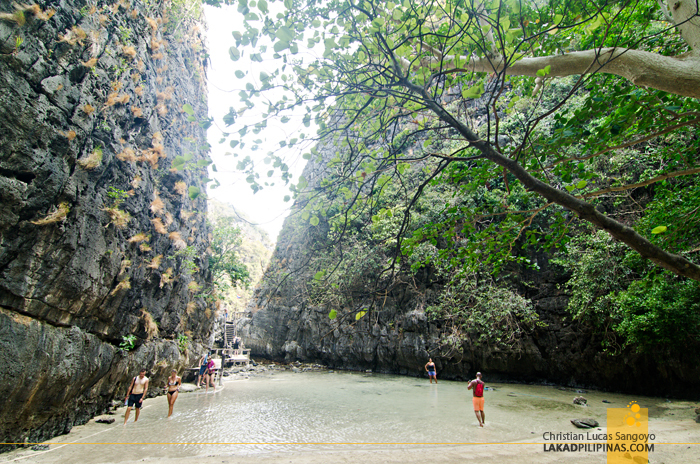 Some of our companions swam, but our stay was too short for us to really appreciate Monkey Beach. 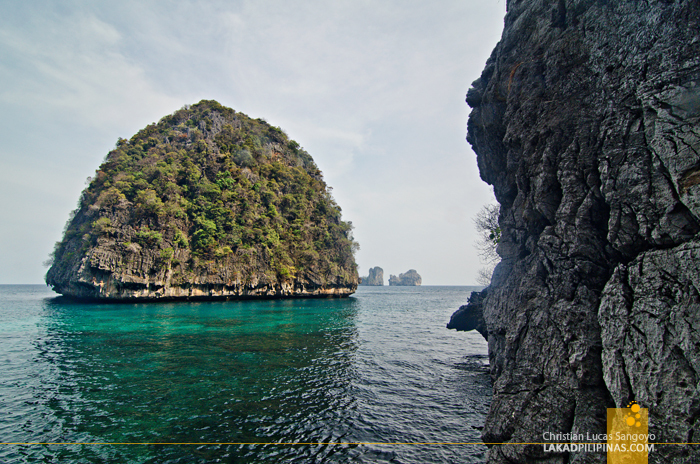 We were soon parting the blue-green waters of Ton Sai Bay once more, leaving Koh Phi Phi Don and heading for Koh Phi Phi Leh where Maya Bay is located. 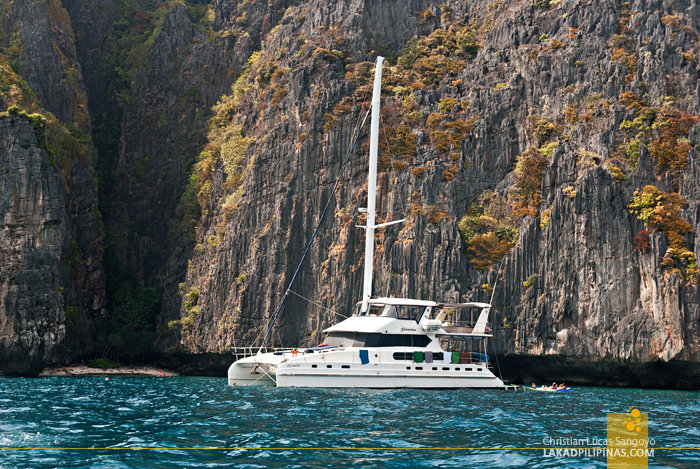 Passing gigantic karsts and numerous long-tail boats, luxury catamaran yachts and speedboats, the mouth of Maya Bay revealed itself, to our dismay. The place was packed with tourists. Well, we should’ve expected that. 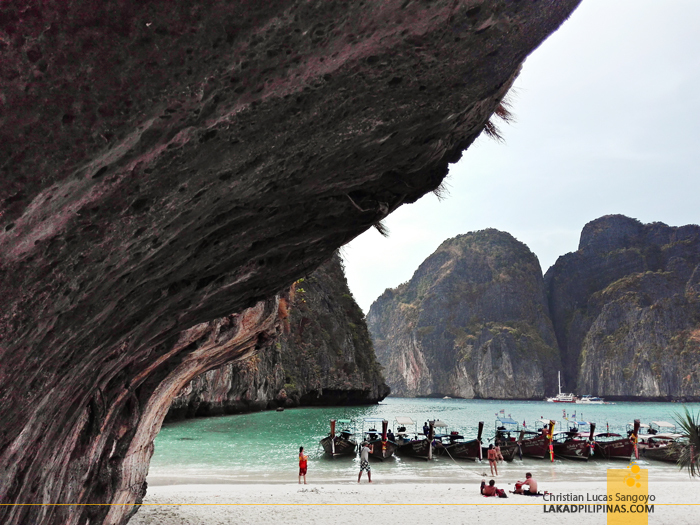 Maya Bay has since been the center of tourism in Krabi after The Beach hit movie theaters in 2000. The story, on the off chance that you’re not familiar with it, revolves around a group of backpackers who left society to form their own perfect resort on a secret beach surrounded by a barrier of limestone cliffs. 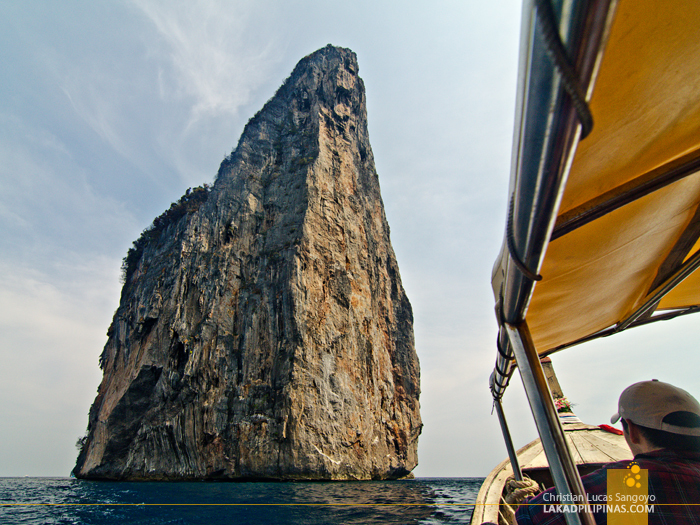 That said barrier is missing a single karst in real life and the beach is hardly any secret at all. As we sailed towards its shore to dock along a line of boats, we quickly saw how crowded the place was. 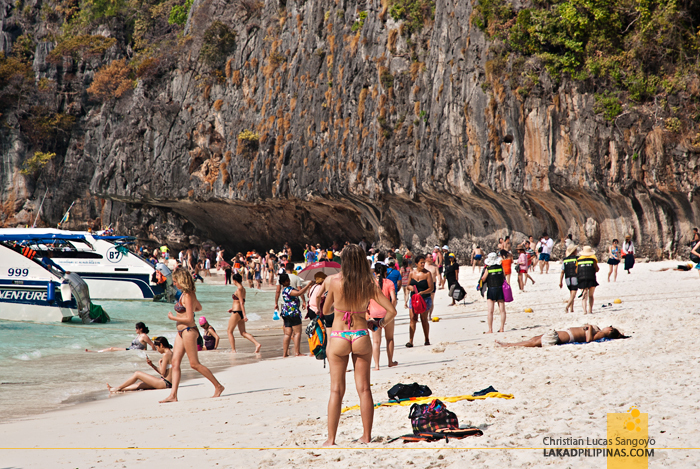 It was as though we were back at Koh Phangan’s Full Moon Party, only, there wasn’t any party. Alighting our boat, we set our beach towel and tried to enjoy the beach, amidst the crowd. To be fair, the sand was quite fine, the water, a beautiful shade of green and the view, still stunning even with the throngs of people. 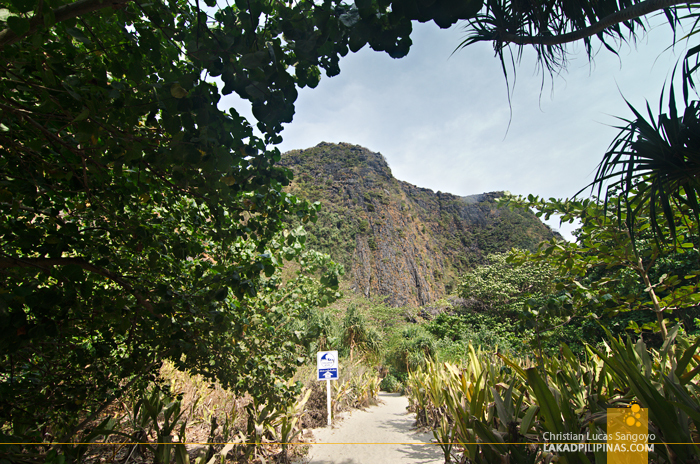 After a few minutes of swimming, we found a trail along the shore beset with lush vegetation leading towards the back of the island. 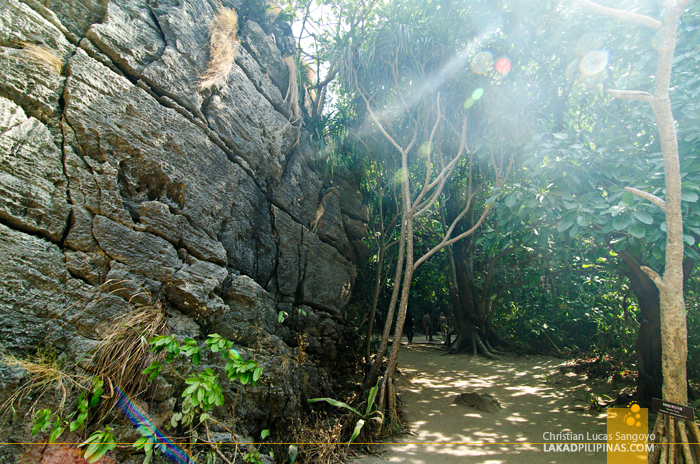 We saw a couple of tourists traversing its sandy path and we followed suit, thinking that it might lead to DiCaprio’s tribal resort. Well, it didn’t lead to the mythical resort, but to toilet and shower stalls, lol. We also found a bunch of huts, not for rental, but for park rangers. A few more steps and we found a small ankle-deep lagoon with a wooden bridge and stairs leading up to its natural rock barrier. 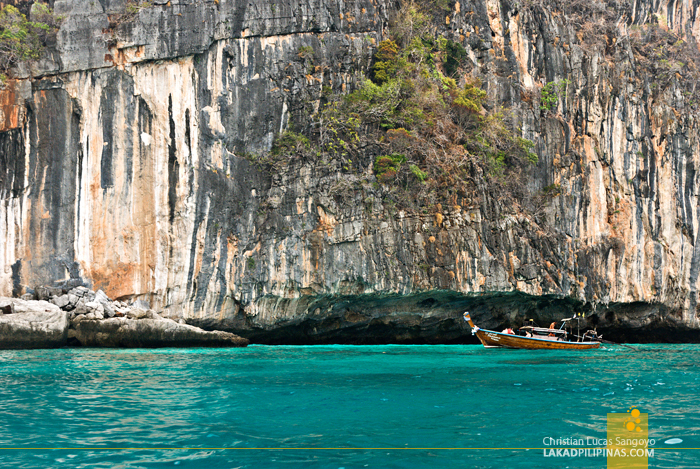 From up above, the grand view of Loh Samah Bay opened up. 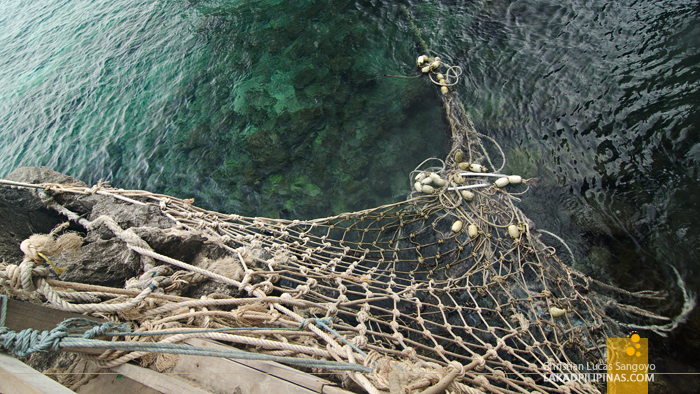 Looking down, we saw a rope ladder leading back to the sea. 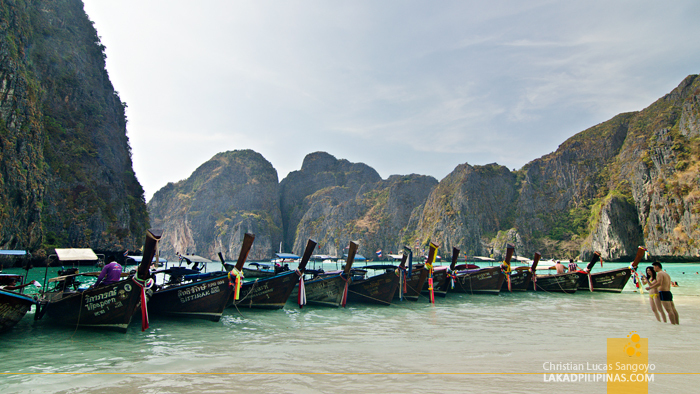 Apparently, doing low tide, tourists have to clamber up here to enter Maya Bay. Boy, am I glad we went during the high tide. Back on our boat, we rounded the south eastern end of Koh Phi Phi Leh and docked along a small lagoon along Loh Samah Bay. This was where the rope ladder we saw earlier led to. I thought we were gonna be climbing that ladder and I was preparing an excuse to say no, but it turns out we’d be snorkeling, haha. 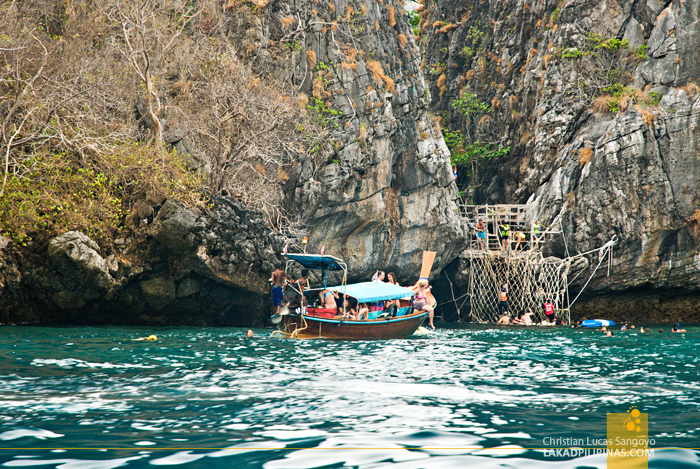 Donning our own masks and snorkels, we jumped on the blue-green waters of the bay and let its cold water envelope our bodies. 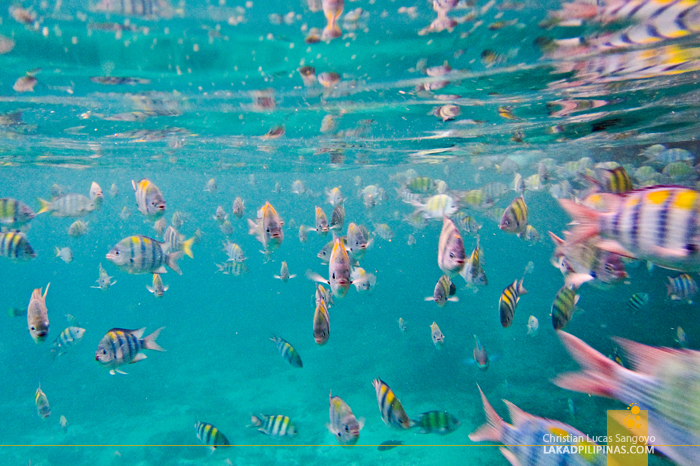 I was quite surprised, as the bubbles cleared, to see corals at the bottom and multitudes of colorful sergeant major fishes swimming about. I’ve read that the marine life in the area has gained heavy damage due to the influx of tourists but I guess they’re now trying to curb and reverse the ill effects of heavy tourism in Koh Phi Phi. 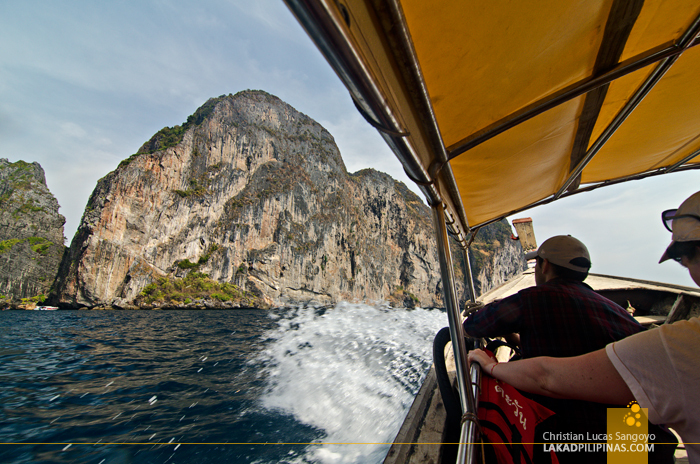 Our next stop was another bay surrounded by lush karsts on the eastern side of the island, the Pileh Bay. 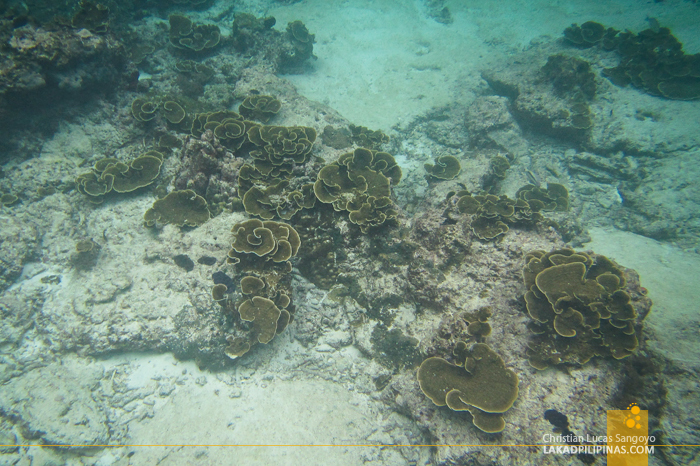 The lagoon was set deep into the island and it somehow reminded me of El Nido’s Big Lagoon. The place is eerily quiet, but somehow, I’m really digging the otherworldly ambience of this pocket of paradise. There really wasn’t much to see under its calm shallow waters but still, we swam for some minutes, enjoying the solitude and tranquility of the lagoon. 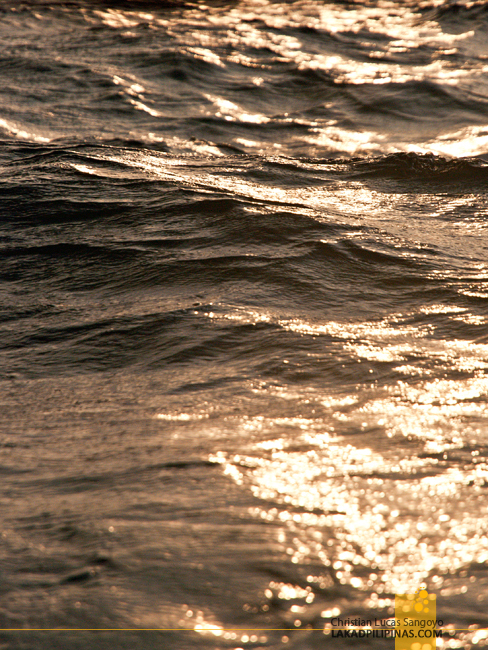 The sun was on its way down as our wooden boat again roared through the sea, the karsts along the island’s fringes, shining magically as golden light bounced off its rough craggy walls. 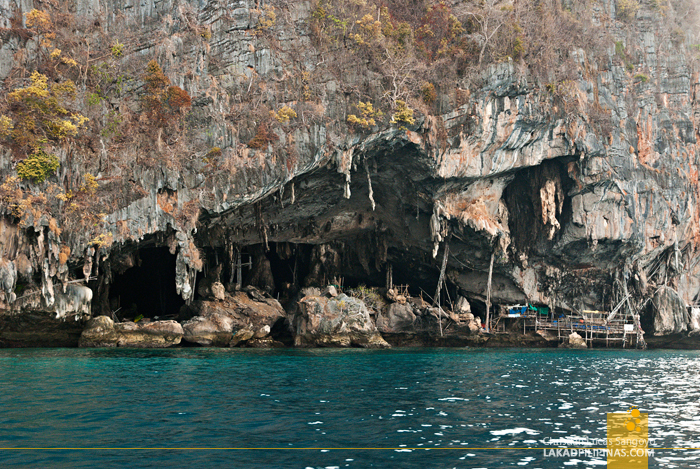 We passed by the Viking Cave, a huge maw along one of the karsts in the area where locals harvest expensive birds nest. These are consumed as a soup delicacy on most Chinese restaurants. I’m not sure if tourists are allowed to dock and explore its rickety platforms. And I’m not sure I want to either. To end the tour, our boat anchored in the middle of Koh Phi Phi Leh and Koh Phi Phi Don as we waited for the sun to lower itself down the horizon. 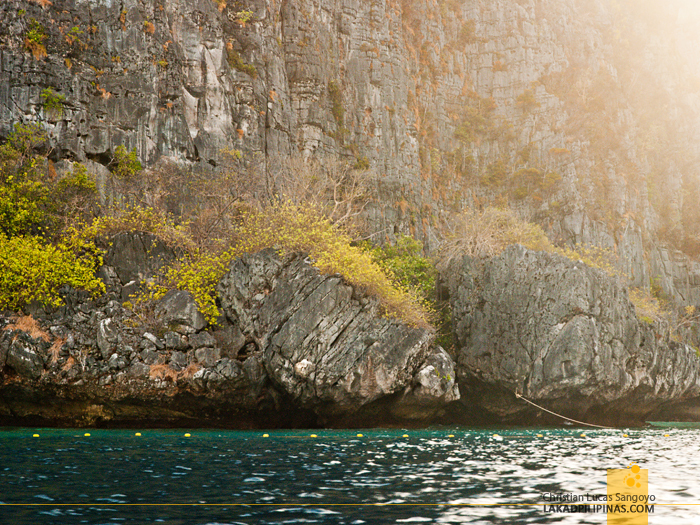 We passed packs of fried rice, fruits and drinks and watched as the waters turn from deep blues to golden oranges. 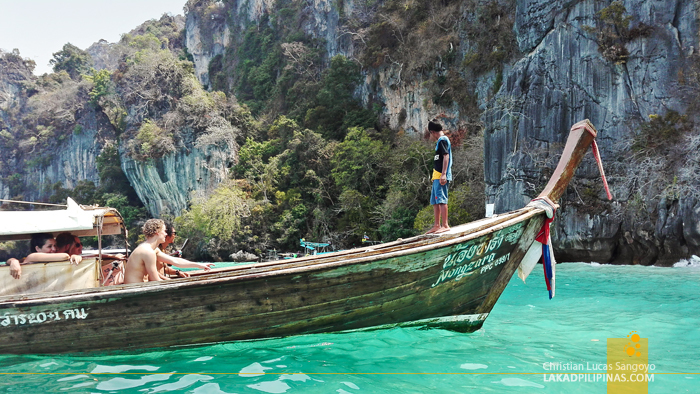 True, we didn’t get to experience the Beach as those fictional backpackers once did in the film, but still, it was probably the best way to end our Krabi experience.